The simple face is you are much more likely to be disabled than killed (where disability is defined as being out of work for longer than 90 days). While disability isn’t exactly a fun thing to think about, it is something we all need to take some time to look into. I will use my wife and I as an example of why uninsured disability can be devastating to your personal finances. We each rely on the other’s income for our monthly budget. We aren’t at the liberty to have one of us stay from work right now. (Maybe in the future!) If I were unemployed we would burn through our emergency fund extremely quickly. Even if we made some serious cuts to our life style, I doubt we could get to a break-even point. And that is just using unemployment as example. Disability isn’t the same as unemployment. Not only are you not earning income, you are also (most likely) draining more income than you would otherwise. If I were in a car wreck and permanently disabled, not only would I not earn a paycheck, I would need rehab or additional medical treatment. This would cause us to burn through cash even more quickly. This situation is where disability insurance can be a huge help. Most of the policies I have seen pay out a monthly check worth 66% of your individual gross monthly income. Let’s say I earn $3,000 gross each month. I would then receive $2,000 from a disability policy. Of course that doesn’t make up for all of the issues, but that would help us keep our heads above water. 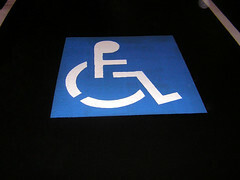 Disability policies give you the option of when the policy kicks in. The faster you want the policy to kick in, the more you pay each month. If you have an emergency fund, I recommend pushing the policy start date back as far as possible. This lowers the cost of the policy per month. Paying less for the same benefit just makes sense. 1. Your employer may offer disability insurance as a free benefit to you. If they don’t offer it for free, they may give you the option to use the employer rates to buy additional coverage for yourself. This is probably the least expensive option. 2. After that, don’t forget to check with any professional associations you have membership with. This is where we are actually getting my wife’s disability insurance with — the National Education Association. The NEA policy includes short and long term disability. 3. If you have no other options, try an independent insurance agency or broker like AccuQuote. We got life insurance through AccuQuote, and they have a division that brokers disability insurance called AccuSource. However, when we called AccuQuote/AccuSource, they said they don’t cover government employees including teachers. Not sure why, but we couldn’t get coverage. So, do you have disability insurance? If so, when does your policy go into effect after disability? My sister in law is disabled and hasn’t worked in over a year. She was lucky enough to have long term disability insurance through her job, which she is still receiving. She has applied for social security disability but thinks she will get denied because she has a rare disease that no one understands. We should really look in to disability insurance, it is something everyone should have. @Mom: Sorry to hear that. A lot of people don’t think to look into disability insurance and it can really be a life saver. Disability insurance policies vary from one company to another and I’m glad you enumerated some of the essential things to consider when buying one. People should not to depend solely on the insurance agent. You gotta make sure you read the policy features carefully because insurance agents may not tell you everything you need to know.